Back On The Ground, Nik Wallenda Dreams Up His Next Walk Wallenda put his circus family back on the map with his high-wire trip across Niagara Falls in 2012. Last week, it was a walk across a 1,500-foot gorge near the Grand Canyon. Of course he gets butterflies, he says, but there's no fear. 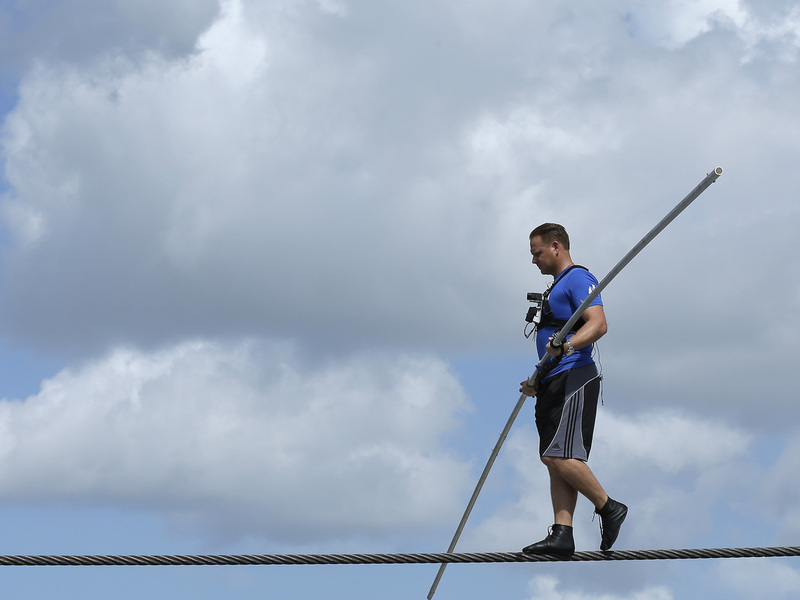 Nik Wallenda practices walking across a wire in Sarasota, Fla., last week. Daredevil Nik Wallenda of the famous "Flying Wallendas" family successfully walked on a 2-inch-thick cable across a 1,500-foot gorge near the Grand Canyon last week — without a net. Back on solid ground, Wallenda says of course he has butterflies, but he doesn't get dizzy and there's no fear. 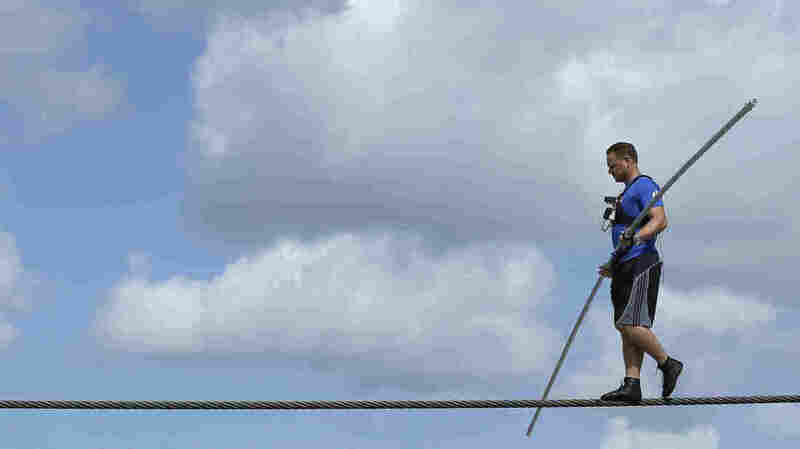 He speaks with weekends on All Things Considered host Jacki Lyden about his latest death-defying walk on the high wire. "I trained on a cable that was about 1,000 feet long [and] lower to the ground, of course, and created wind gusts of 45 to 55 miles per hour, including wind speeds of 91 miles per hour. [I] walked in repetitions to the point where I was walking four times the distance I would walk over the Grand Canyon." "Our industry at that point especially was extremely competitive. And my great grandfather, matter of fact, used to rehearse in the middle of the night so his other competitors couldn't see what he was doing. That's how competitive it was. ... I think that's what made my family who they were." "I guess I'm the bad Wallenda. I want to make sure that people can relate to me, that hey, here's a guy who is married with three kids. He eats, sleeps, drinks, bleeds just like the rest of us yet he has a very unique occupation." "[I have] several dreams — I want to walk to the top of the Eiffel Tour, I want to walk over the pyramids in Egypt, the Great Wall of China. I'll start working on a walk in New York City hopefully coming up within a year."